This is the first of a series of articles to recap this major event, answer your questions and provide information for future preparedness. We all thought the Ice Storm of 2016 was the worst it could get. Well, the snowstorm of 2019 proved us wrong. 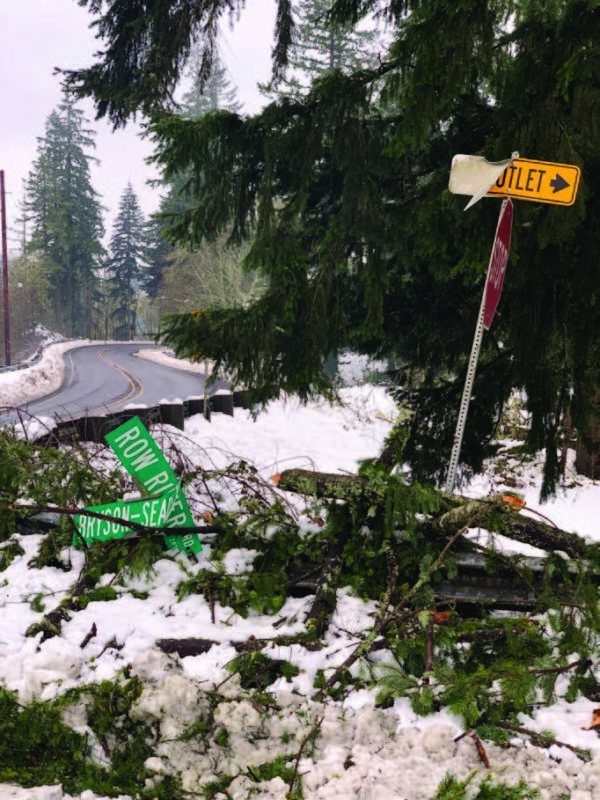 Beginning Sunday, February 24, and continuing into the next several days, a heavy, wet snow blanketed the Eugene area and wreaked havoc on both transmission and distribution lines that carry power to Lane Electric members throughout 2,600 miles of rural Lane County. By the time the snow stopped falling, 19.1 inches were reported in the Eugene area by the National Weather Service, making it the fifth snowiest month measured in this area since 1892, when the NWS began keeping records. Countless trees crashed down on power lines and poles throughout the valley, leaving 77 percent of our service territory—or 10,120 members—without power. Complete restoration efforts took 14 days. We don’t know for certain, but this may have been the most widespread and longest-lasting outage of Lane Electric’s 80-year history. 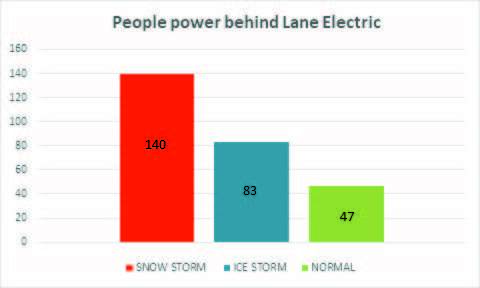 Early on, Lane Electric management realized this was a devastating storm and that we needed additional crews. We called on other rural electric cooperatives in the state plus other utilities and contract crews. For the first several days, some crews couldn’t get to our service territory due to road closures and restoration work needing to be done in their own area. But eventually, we had linemen hailing from all across the state, plus Washington and Wyoming. In total, we added 95 linemen to our usual crew of 16. Why didn’t you bring in more crews? 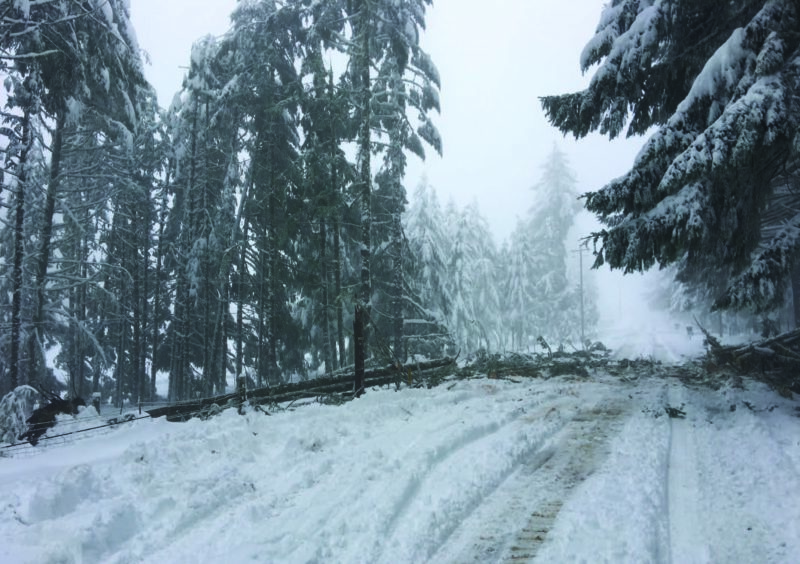 Downed trees and snow-covered roads made accessing damaged lines difficult after the storm. Logistically, 19 crews in addition to our four crews is the maximum number we can manage safely and efficiently. Plus, crews were in high demand because we weren’t the only utility in the state facing severe damage. Lane County was one of 10 counties Oregon Gov. Kate Brown declared to be in a state of emergency. To the south, damage in Douglas County was so extreme that even with 27 crews working, Douglas Electric Cooperative still had 290 members without power as of press time on March 18. Not only did we need more crews, but we needed more materials for them to complete repair work. Poles had to be produced in an unprecedented amount of time—lead time is usually four weeks and we needed them in two days. Plus, we expedited the shipment of wire from states as far away as Kansas. Other utilities not only sent linemen, but also provided warehouse support, materials, vehicles and specialized equipment. Behind the scenes, 28 Lane Electric staff worked long hours to orchestrate our restoration efforts, including coordinating logistics with the Oregon Department of Transportation, the Bonneville Power Administration, Lane County and partnering utilities; ordering and managing materials; and organizing meals, laundry and housing for the additional crews. From the accounting department to the lineworkers, it was an all-hands-on-deck operation. Why did it take so long to restore my power? There is a systematic process by which power restoration of this magnitude needs to happen. First, we must do a damage assessment to know what materials and labor are needed for the repair work. Assessing our system of 1,400 miles of line takes time. Covering that distance is like driving from Eugene to San Francisco, back to Eugene, and almost all the way back to San Francisco again. In many areas, the roads needed to be cleared and trees removed before we could begin damage assessment and repairs. In other areas, damage was in off-road areas that required specialized heavy equipment to reach. We supplemented our on-the-ground patrolling with helicopter surveillance to aid in decision-making about the restoration efforts. Despite the record number of crews we had working and extra equipment we were able to obtain, it took time to cover every inch of our territory. Fallen trees over power lines caused many outages in difficult-to-reach areas. 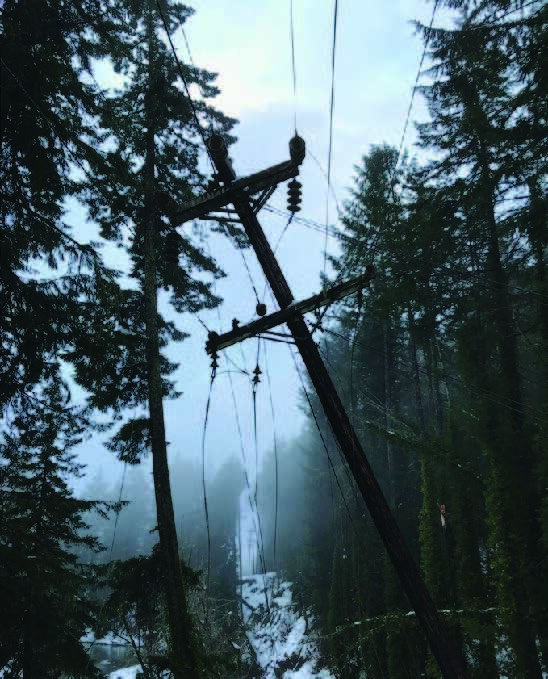 A major obstacle was damage to Bonneville Power Administration’s transmission lines that deliver energy to the substations that feed our distribution lines and eventually your homes and businesses. At the peak of the outage, all but one of BPA’s substations in our service territory were without power. This was unprecedented. Our crews worked closely with BPA crews to get repairs done on transmission lines while other crews repaired our distribution lines so we could get your power back on as quickly as possible after the substations were online again. Six tree crews worked in sync with our linemen to clear trees from the lines and right-of-way before we could re-string wire and set new poles. We also collaborated with Lane County and ODOT for road access and plowing. The best example of this was in Oakridge where ODOT needed to close Highway 58 due to safety concerns but was eventually able to open it up to allow us to get power restored. During outages, we are commonly compared to our neighboring utilities, with whom we have a great relationship. For utilities that serve more densely populated areas, power invariably is restored to their customers more quickly than our members are energized. The reason is simple: Our service territories couldn’t be more different. In heavily populated areas of the county, the damage from trees is often not as significant and roads are typically more accessible. Plus, when power is restored, it is restored in neighborhoods and city blocks. In our service territory, we enjoy treelined roads, more remote areas and an average of only seven members for every mile of power line. Once substations are energized, we work our way out on the feeder lines and taps. There may be only a handful of members in a span of several miles of line. For this reason, our members need to be prepared and self-sufficient, as they are often on their own for an extended time. Why couldn’t we get more frequent updates with specific information? Triple our normal number of employees were working during the 2019 snowstorm and nearly double during the ice storm of 2016. Throughout the restoration process—from damage assessment to repair work and eventual restoration—it takes time to get information from the field and distill it for member communications. With an outage this extensive, it can take several hours and even days to put together all the pieces and provide an accurate update. Due to a number of variables, providing an exact restoration time for a specific road is nearly impossible. We gave our best estimate for overarching areas, and usually on the long side to help you prepare for what could be the worst-case scenario. We wished we could have given you more details, but we gave you what was available. We will explore more technology options that could help get us more real-time data and disperse it to members more quickly. Even so, that technology likely would rely on internet or cell service, which many of you were without for several days. Crews from other utilities have been sent home, but Lane Electric’s crews are continuing restoration work in the aftermath of the storm. They are addressing hazard trees and branches that were partially damaged in the storm and could now fall into power lines during inclement weather, and they are retrieving downed poles and wires that were covered by snow or fallen trees. This clean-up phase will last several months. Extra crews may be called back in to help us. Reflecting back and looking forward, we want to reiterate that everyone at Lane Electric—from the staff in the office and warehouse to the crews out in the field—does everything possible to keep you out of the dark, literally and figuratively. We have successes to be proud of during this major event, including our safety record. We had no lost-time accidents during an intense two weeks. We have had an all-employee debrief and will debrief with our partners at other utilities and emergency responders throughout Lane County to deepen our relationships with them. This experience reminds us all that we need to be prepared to be on our own— and to be thankful when everything is in order and the lights come on with the flip of a switch. NEXT ISSUE: Why can’t we underground all the lines. And disaster preparedness lessons learned.